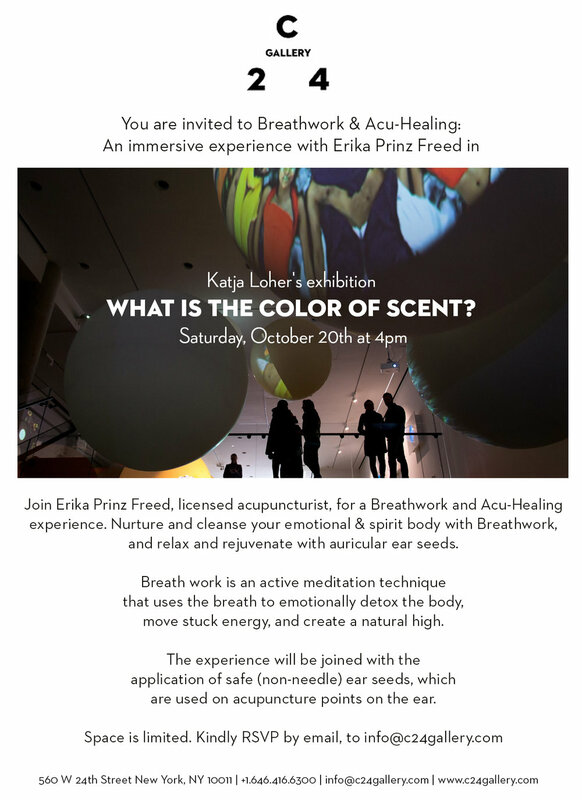 I’m pleased to announced a collaboration with the internationally renowned artist, Katja Loher, in an immersive Breathwork & Acu-Healing experience at C24 Gallery. Katja’s show, “What Is the Color of Scent,” transforms the gallery space into an ethereal world in which the viewer journeys through an enchanted universe altered by vision, sound, and scent. The event on October 20th at 4pm will be held within the artwork and will feature Breatwork healing, an active meditation that clears stuck energy and frees up the emotional body, followed by the application of auricular (ear) seeds.